Ahead of Sunday’s Monster Energy NASCAR Cup Series Can-Am 500 at ISM Raceway in Phoenix (2:30 p.m. ET on NBC, MRN, SiriusXM NASCAR Radio) — the final race in the Round of 8 — we take a look back on the 2017 event where Matt Kenseth won what could be his final victory, Chase Elliott exacted a measure of revenge on Denny Hamlin and the Championship 4 field was confirmed. Kyle Busch, Kevin Harvick and Martin Truex Jr. knew where they stood coming into the Monster Energy NASCAR Cup Series Round of 8 elimination race at ISM Raceway, with each assured a spot in the Championship 4 at Homestead-Miami Speedway. Busch and Harvick by virtue of winning the prior two races within the round (Busch at Martinsville, Harvick at Texas), and Truex due to his commanding points tally. The one remaining position would be settled among Brad Keselowski (+19 points above the provisional transfer line), Denny Hamlin (-19), Ryan Blaney (-22), Chase Elliott (-49) and Jimmie Johnson (-51). Keselowski’s points cushion placed the onus on the other four drivers to either win, or have a great finish accompanied with Keselowski turning in a subpar performance. Any playoff elimination race is tinged with an extra level of intensity, but there was a heightened sense at ISM that Elliott and Hamlin might add a new chapter to their budding rivalry because of what transpired two weeks before at Martinsville Speedway. During that race Elliott had been leading late when Hamlin’s aggressive move wrecked Elliott with only a handful of laps remaining. Afterward the normally mild-mannered Elliott confronted Hamlin making it known he would race him vastly different going forward. Although Elliott never definitively said he would extract payback on Hamlin, that Hamlin had prevented him from automatically advancing to the Championship 4 and essentially placed him in a must-win situation for the remainder of the Round 8 was something Elliott hadn’t forgotten coming into the penultimate playoff race. For much of the afternoon, Hamlin didn’t have to concern himself with Elliott; Hamlin had the fastest car and was running well ahead of his rival, leading 193 of the first 231 laps. But the two eventually found themselves next to one another and it was then Elliott appeared to get payback, nudging Hamlin up the track and into the frontstretch wall off Turn 4. The contact caused an immediate tire rub on the right rear of Hamlin’s car. A few laps later the damage punctured the tire and sent Hamlin crashing. Elliott had his retribution; Hamlin was out of the race and also now eliminated from the playoffs. With Hamlin in the garage, Elliott and Matt Kenseth emerged as the likely winners. They would jostle for the lead over the final 80 laps, with each passing the other in a battle that represented NASCAR’s old guard versus its future generation. Kenseth doggedly ran down Elliott and made the winning pass with 10 laps remaining, denying Elliott a win to clinch a berth in the Championship 4. For Kenseth, the triumph carried great significance beyond it just being the 39th victory of his career and snapping a 51-race winless streak. On this same weekend he had publicly announced that he would stop racing full-time at the end of the season. 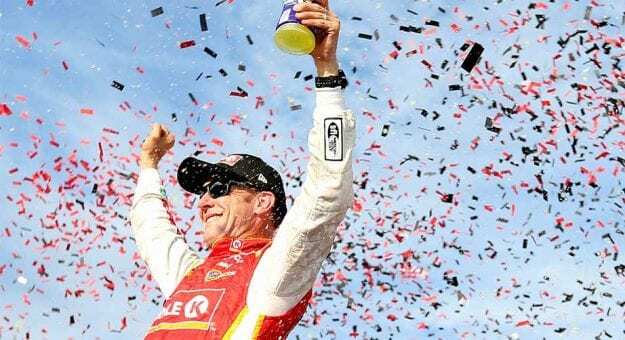 Joe Gibbs Racing did not have a place for him on its 2018 roster, and Kenseth had not found an opportunity elsewhere, so he was going to step back until a suitable option materialized. And the magnitude that this may be his final visit to Victory Lane was not lost on Kenseth, who showed some rare emotion in celebrating the accomplishment. “It’s a pretty special day — hard to describe,” he said. 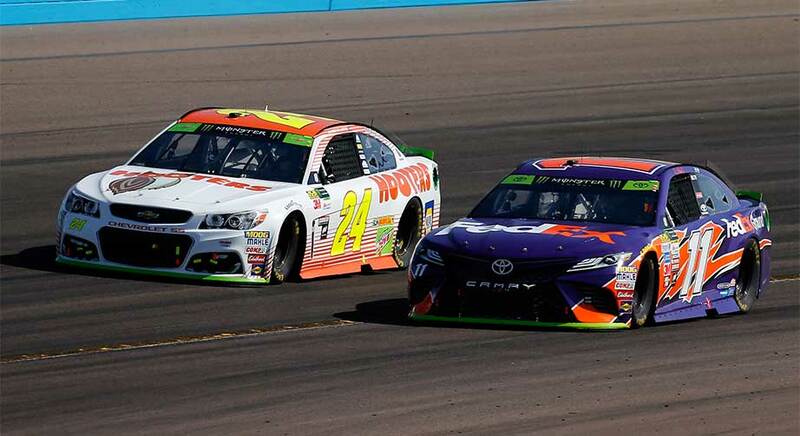 The Elliott and Hamlin rivalry had been settled with each costing the other a potential spot in the Championship 4. There have been no incidents between the two since.